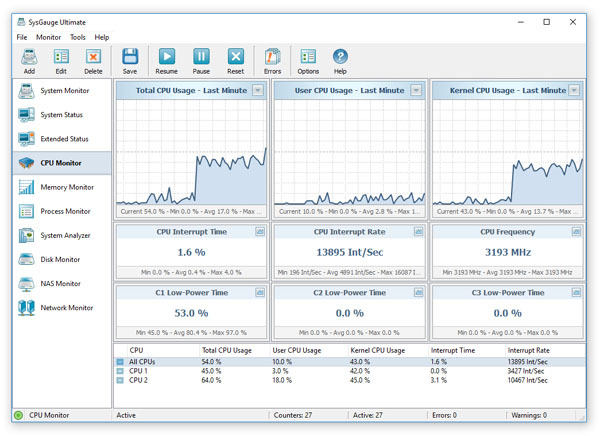 The 'CPU Monitor' GUI module is a dedicated CPU monitoring GUI module showing the total CPU usage, user CPU usage, kernel CPU usage, CPU interrupt time, CPU interrupt rate, the current CPU frequency, the C1 low-power state, C2 low-power state and C3 low-power state. The bottom part of the GUI module includes a list of CPUs in the monitored system and all the monitoring counters are showing the monitoring data for the currently selected CPU. In addition, the user is provided with the ability to display the aggregated monitoring data for all CPUs. The CPU usage charts located on the top side of the GUI module allow one to display the monitoring data for the last minute, last 2 minutes or last 5 minutes. In addition, the user is provided with the ability to display data charts from all other counters by pressing on the 'Chart' button located in the top-right corner of each counter. The data chart dialog provides the ability to view the monitoring data for the last minute, last 2 minutes or last 5 minutes. In addition, the user is provided with the ability export the counter's monitoring data, pause, resume and reset the monitor. In addition to the dedicated CPU monitor module, the user can use the customizable 'System Monitor' module to configure user-custom CPU monitoring profiles. In order to add a CPU usage counter, press the 'Add' button located on the main toolbar, selected the 'CPU Usage' counters category in the left-side view and then select an appropriate CPU usage counter in the middle view. By default, SysGauge will monitor all CPUs, but if required, the user can select a specific CPU to monitor in the right-side view. In addition, in order to monitor the CPU usage in a remote computer via the network, press the 'Connect' button located in the bottom-left corner and specify the host name of the remote computer to monitor. CPU Usage - this counter is the primary indicator of the processor activity and it displays the average percentage of the processor busy time observed during the sample interval. CPU Usage User - this counter measures the percentage of elapsed time the processor spends in the user mode. User mode is a restricted processing mode designed for user applications, environment subsystems, and integral subsystems. CPU Usage System - this counter measures the percentage of elapsed time that the processor spent executing code in privileged mode. When a Windows system service in called, the service will often run in privileged mode to gain access to system-private data. CPU Interrupt Time - this counter measures the time the processor spends receiving and servicing hardware interrupts during sample intervals. This value is an indirect indicator of the activity of devices that generate interrupts, such as the system clock, the mouse, disk drivers, data communication lines, network interface cards and other peripheral devices. These devices normally interrupt the processor when they have completed a task or require attention. Normal thread execution is suspended during interrupts. Most system clocks interrupt the processor every 10 milliseconds, creating a background of interrupt activity. This counter displays the average busy time as a percentage of the sample time. CPU Interrupt Rate - this counter measures the average rate, in incidents per second, at which the processor received and serviced hardware interrupts. This value is an indirect indicator of the activity of devices that generate interrupts, such as the system clock, the mouse, disk drivers, data communication lines, network interface cards, and other peripheral devices. These devices normally interrupt the processor when they have completed a task or require attention. Normal thread execution is suspended. The system clock typically interrupts the processor every 10 milliseconds, creating a background of interrupt activity. This counter displays the difference between the values observed in the last two samples, divided by the duration of the sample interval. CPU C1, C2, C3 Low-Power Time - these counters show the percentage of time the CPU spent in one of these low-power states. CPU Frequency - this counter shows the current CPU frequency. CPU Percent of Max Frequency - this counter shows the current percentage of the maximum CPU frequency. 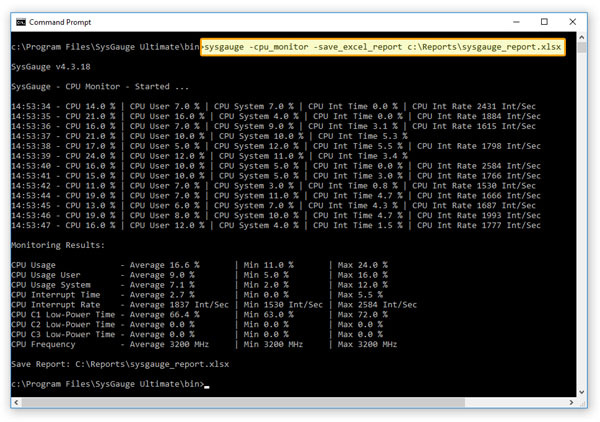 The SysGauge command line utility, which is available in SysGauge Ultimate, provides the ability to monitor the CPU usage and save CPU usage monitoring reports from batch files and shell scripts. The command line utility is located in the SysGauge 'bin' directory and it can be used to monitor the local system or remote servers via the network. This command will perform a CPU usage monitoring operation using a number of CPU monitoring counters including the total CPU usage, the user-level CPU usage, the system-level CPU usage, the CPU interrupt time, the CPU interrupt rate, the C1, C2 and C3 low-power CPU states and the CPU frequency. In addition, after the monitoring operation will be completed, SysGauge will save an Excel CPU usage monitoring report to the specified file or directory. By default, the CPU usage monitor reports the total CPU usage statistics for all CPUs in the monitored system. This command line option enables individual CPU usage monitoring counters for each CPU and the CPU usage monitoring results will include individual CPU usage statistics for each CPU or CPU core in the monitored system. 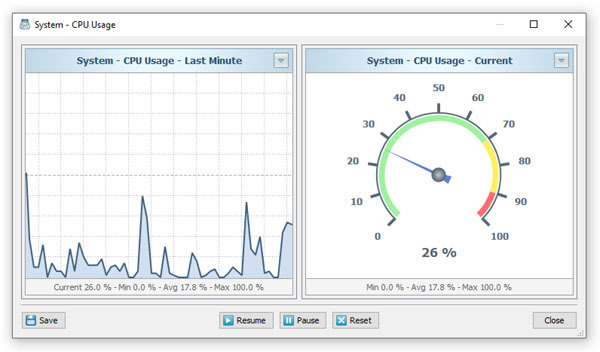 This option allows one to monitor the CPU usage in remote servers via the network. This command line option saves an HTML CPU monitoring report. This command line option saves a PDF CPU monitoring report. This command line option saves an Excel CPU monitoring report. This command line option saves a text CPU monitoring report. This command line option saves a CSV CPU monitoring report. This command line option saves an XML CPU monitoring report.